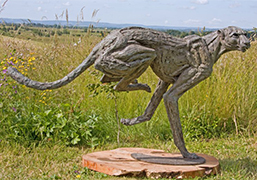 Jan Sweeney sculpture is instantly recognisable, full of energy, movement and strong texture with trademark hollow eyes – a compelling feature of the big cat and wildlife sculpture. “I always work from life taking the modelling wax to the subject even in the Zambezei valley to create an African wildlife sculpture. I have been inspired by watching these animals in their natural habitant especially in the untouched wilderness which is still to be found in Africa. There the unwary die so even when an animal is at rest it is ready to flee. It is the untamed strength and power always ready to explode into movement that I want to translate into a bronze sculpture. I work from life whenever possible, I take wax into the bush make hollow shapes filled with wet newspaper and keep cool boxes of cold water. 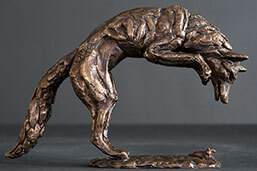 Dogs have been an important part of my life, I grew up with whippets and my very first bronze sculpture was a whippet. Large bronze sculptures suitable for the garden. 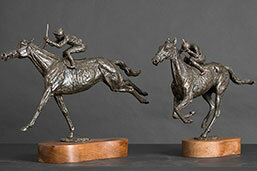 Miniatures came before the minis as small bronze sculptures keeping the same movement. Jan Sweeney sculpture is cast in “hot” bronze and is virtually indestructible, a family heirloom to be passed down the generations. 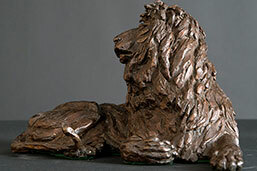 Bronze sculpture is stunning in a garden setting, patio or is suitable for the house. Had a brilliant time at the workshop Jan is a fantastic sculptor and shares a wealth of information. She clearly explains the techniques helping you to produce some great first models. I learnt a great deal and look forward to developing my skills further. I wanted to thank you for such a great course you did for me, You helped me to refocus and see what is important to any animal sculpture I want to make. You have inspired me to better things and I know that the information you imparted to me was of enormous use and value. Thank you once again and good luck with all your future projects. I am happy to say that I thoroughly enjoyed the clay course with Jan. It was inspiring to learn from her experience and to learn new techniques to try out at home. I recommend this course to any aspiring sculptor from beginner upwards! Jan’s vast experience and expertise made for a very informative and useful course, on which I learnt a great deal not only about how to work in clay but also about the anatomy of the particular animals that I wanted to work with. I was amazed at how much I could achieve in just the three days working with her! The picture on the website was great, but in the flesh, as it were, it is so much better. I am truly delighted with it. 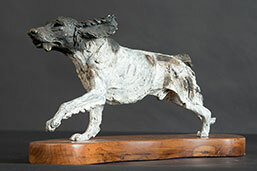 Delightful Saluki sculpture arrived yesterday. Many thanks. It is very beautiful. You are a very talented lady. It is a great privilege to be able to see your work ‘in the flesh’ at the shows. My father and I booked on the course as enthusiastic novices, and had a great time. It was totally absorbing and a wonderful escape from everyday life. It’s all very informal and bohemian in style but at the end of it you come away with your own sculptures and a lot of new skills. Jan is a thoughtful teacher who gets the balance right between helping you and letting you learn by doing. She is someone who would be positively described as ‘one of life’s characters’ which for us added to the richness of the whole experience. I’d have no hesitation in recommending the course to people. I arrived at 10am on the Saturday morning unaware of there being an artistic chromosome in my body (my husband had bought me the course as a birthday present). By Saturday lunch time I had begun to understand the skills needed to sculpt wildlife from clay; I even had a recognisable owl to my credit. By the end of three days I actually felt as if I knew something of the subject of clay sculpture and had added a chimp and lion sculptures to the repertoire. All of this was down to Jan. She is an art wizard, who with a prod of the clay here and the flick of a knife there can transform a lump of clay into a dog, cheetah, a meerkat…or whatever it is you are attempting to make. It really is a privilege to be able to watch a master such as Jan Sweeney at work. This is a real ‘hands on’ course; there are no lectures you simply get on with it, you learn by your mistakes and Jan is on hand to pick up the pieces, literally, when it starts to go wrong. I really had a fantastic time and wouldn’t hesitate in recommending this course. I own one of Jan Sweeney’s bronzes, and when I became aware that she gave hands-on tuition in the sculpting process, my wife’s offer to buy me a weekend course was just too good to miss. Jan keeps her classes small – we had four in ours – and she gave us her entire attention for both days. As a result, we each produced three clay sculptures, and each of us was delighted with the results – my wife refused to believe that my meerkat was my own work. Simples! The course was hugely instructive, great fun, and terrific value – I shall be back! I received the Running Hare this morning. I think it is absolutely wonderful! You are right. I do love it and am quite delighted that I allowed myself to indulge myself and do not feel guilty!! I am sure it will be greatly admired by visitors as the two make up my own story as well! Thank you for your prompt and friendly attention. I wish Jan great success and joy with her art. I wouldn’t doubt I will be back for another. Thank you again. My parents will be thrilled when they see the sculpture for the first time. I only wish I was able to purchase more of Jan’s work. 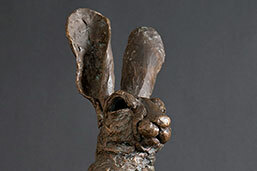 We recently purchased some Miniature Boxing Hares from Jan Sweeney. They really are delightful pieces, with the style both conveying a fantastic sense of realism whilst at the same time displaying the sculptors considerable artistic skills. They are beautifully tactile, and it is difficult to stop keep picking them up. They now live on the mantelpiece where they look like they have lived for ever. A beautiful piece of original sculpture and an ideal 40th birthday present. The ancient art of casting in bronze can seem a mysterious and intimidating process to the ceramic artist. 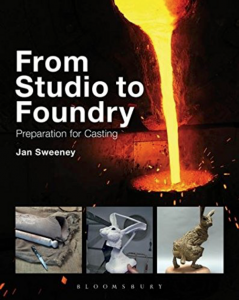 In From Studio to Foundry: Preparation for Casting, Jan demystifies the practice and offers two fantastic projects that will enable the artist to prepare their work for casting at a foundry. This is the essential reference for any artist wishing to produce their work in bronze.